Guard duo provides experience to the team. Dalton Pepper had never played more than 26 minutes or scored more than 15 points in a collegiate game. The redshirt-senior guard set career highs against the University of Pennsylvania, scoring 19 points – a team high – in 31 minutes of action. He also grabbed nine rebounds, nearly doubling his previous career high of five. It was his second career start, and first at Temple. “He’s a really good man and I’m rooting like crazy for him,” Dunphy added. Pepper is the only senior on the team, and despite averaging 11.3 minutes a game last season, is one of the more experienced Owls. 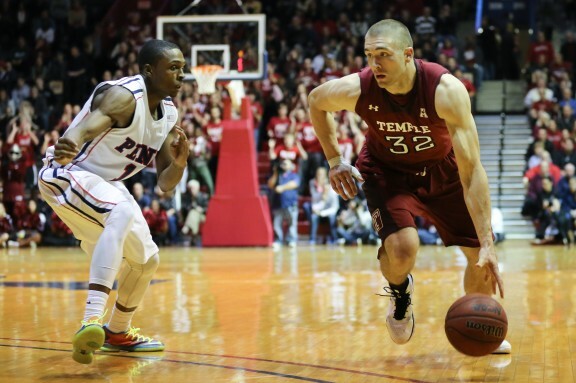 He will need to both get his confidence back and lead the young players for Temple to be successful. Cummings also set a career high in points, scoring 18 points, 12 of which came in the second half. He played 29 minutes, nearly six more than his average last year, but Dunphy said he wanted Cummings to have more minutes. While Penn only led for 19 seconds of the second half, the game was tight for the last six minutes. Cummings said the August trip to Europe helped the Owls stay focused.